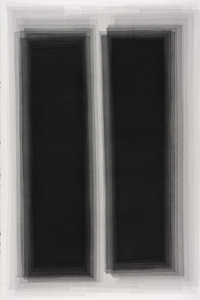 In the statement accompanying German artist Joachim Bandau’s new solo exhibit at the Patricia Sweetow Gallery, he writes of his watercolors that “the observer decodes the work in reverse.” He is referring to the composite nature of individual paintings, but this statement can be applied to the ordering of the exhibit itself, which sequentially untraces Bandau’s steps towards the fragility and liquidity of his most recent pieces. Three distinct chapters of his work, in three different mediums, are included in the show. His evolution as an artist has not been one of subtle transformations, but the succession has been both coherent and provocative. The exhibit focuses on a new selection of bony, grayscale watercolors that continue a body of work originally begun by Bandau in 1983. He calls this series of paintings Schwarz-Aquarelle, or Black Watercolors. They entail the precise addition of one transparent rectilinear wash of gray over another, each layer surrendering to the focal sum of a united black field. In some examples, this black figure of overlapping sweeps is achieved with the patchy irregularity and unlikely unity of a dust bunny, such as with Untitled (JBA 45). Much of Bandau’s earlier watercolor work falls into this design category, geometric silhouettes peripherally displaying their margins, and surrounding an unknown weighted center. Their mutual interruptions are sculptural. They can also be seen as accidental time-lapse photographs, in which the contour form of something is enlarged and perverted by a series of quick, sudden movements. Within the black centers, the layers conduct tricks on the eye, leading to the discovery of shapes and divisions of space that are not always genuinely hidden there in the hollows of the mock opacity. In the quadruplet centerpiece Untitled (JBA 41), Bandau takes a different approach. Grisaille shards are spread like a hand of cards, or like a fan of shadows produced by a single object beneath a row of make-up lights. These four paintings were made with a worryingly “random” design plan. The individual forms are more even in size and density, and more evenly separated from each other, as Bandau indulges in a more graphic hook. This use of uniformity and increased delineation attracts the question of whether these forms are meant to be surfaces actually sitting on top of one another, like slides on a light table. Are we looking, instead, at notational shorthand for something purely cerebral? Are these structural-spatial concepts visually filed together like letters in a sentence, phrased on the same line in a conceptual airspace? Like a compressed database of electronic records, their content would be illegible. Stacked, unhinged pieces of something unassembled do add up to something, however. We are supplied with clues as to what through the examination of Bandau’s other works, his drawings and sculptures. Bandau began his illustrations of World War II era bunkers rather reluctantly. Born in 1936 in Köln, and witnessing Nazi brutality as a child, he became deeply opposed to glorifying militarism in any of its manifestations. However, when he was invited to participate in a competition organized by the German Air Force, he accepted the assignment because he needed the money, and produced for it the very first of his architectural projection drawings of bunkers and bomb shelters. The art-book publisher Walter Koenig liked the drawings and encouraged Bandau to continue on with them, which he did, producing many more pictures of bleak, empty structures within empty landscapes. In the back room of the Sweetow gallery are a small selection of these drawings, produced in the 1970’s, which call to mind the tonic Utopianism of the Bauhaus, before Nazism liquidated Germany’s avante garde in 1933. They function somewhat as impersonal grave markers for the dream cities that the future did not bring to pass. With the exception of the deficient and dilapidated Brasilia, Oscar Niemeyer and Lucio Costa’s interpretation of Le Corbusier’s plans for the cities of the future (and perhaps the new Clinton Presidential Library, which looks like a distorted Ville Savoye), contemporary culture has discovered that urban Utopia is too waterlogged with its own definition: “no such place.” Here in the twenty-first century, as it turns out, we do not work and live in Kazimir Malevich’s Architectons within the welded city gates of Ludwig Hilbersheimer’s Ideal City. Instead, the International Style of the Bauhaus, in all its sleek socialist elegance, has been boiled down to a slick IKEA model of the universe. It’s a little bit socialist, but mostly just cheap. In Bandau’s drawing Kastenbunker, we see a simple pillbox bunker, a guard post with embrasures. This kind of covered pit construction was the most basic of mass market warfare architecture, and during the period of the German Atlantikwall, 1941-1944, roughly 14,000 concrete bunkers approximately like this were built along the coasts of occupied Axis territory. Eventually, to speed up the construction of these bunkers, their design was meticulously standardized, a practice of functionalist architecture that the Third Reich inherited, in part, from the Bauhaus. The Nazis took Bauhaus ideas of social housing and city planning, which they had publicly dismissed as Bolshevik nonsense, and applied the strategy to the production of military defense. During the Weimar Republic, with the Bauhaus as its intellectual epicenter, worship of unfettered utility and prejudice against ornament went hand in hand with a sincere belief in environmental determinism, and the understanding that modern architecture would rationalize and streamline society. The mass production of public housing was seen as visionary for the working class as well as everyone else and its planning was a moral argument: anti-slum, anti-waste, and anti-taste. The siedlung housing project was the very shape of economic, geometric, and serialized equality. Bandau’s Vormarsch, the aerial projection drawing of a field of evaporating structures, seems to potentially graph the disappearance of such an ideal. But what could be just social housing, or even military personnel shelters, also contains the distinct, loitering suggestion of the prisoner barracks at Auschwitz-Birkenau. “Vormarsch” means “advance.” In addition to the military advance of the Atlantikwall, the stylistic advance of sheet glass exteriors on buildings, and the technological advance of reinforced concrete and steel grids, another possible interpretation for Bandau’s use of this word is evolutionary advance, and the attempts to orchestrate it by Nazi eugenics projects. Unlike Heinrich Himmler’s Lebensborn breeding scheme, which sought to produce flawless Aryans from hand-picked “racially pure” men and women, the majority of Josef Mengele’s eugenics work at Auschwitz had to do with the analysis and brutalization of identical twins. To challenge a falling national birth rate, Mengele planned to learn how to induce multiple births, and thereby mass produce the German race in numbers suitable for populating the entire world. The chalk outlines of surveyed, vacant land plots that occupy most of Vormarsch are a reminder of the grotesque racial theory that amounted to only forced sterilization, mutilation, and genocide. Bunker Architektur, which Bandau produced in 1977, again echoes the Utopian landscape of city wide development in the International Style. German architect and director of the Bauhaus Mies van der Rohe was fairly uninterested in mapping out an entire city plan, unlike his contemporaries Walter Gropius and Le Corbusier. Nevertheless, van der Rohe, to whom the modern plate glass skyscraper is attributed, ultimately had the most influence on sculpting modern urban planning. He immigrated to the United States in the late 1930’s, finding enough peace, space, money, and lack of tradition to execute his radical architecture. He left Germany after Joseph Goebbels passed him over for the position of chief architect of the propaganda ministry for the Third Reich. Goebbels selected instead the more conservative and politically dependable Albert Speer. In the years 1948-1951 van der Rohe erected the twin towers of the Lake Shore Drive apartments in Chicago, the first buildings ever to use an all glass and steel curtain wall in their construction. These towers were a direct architectural precursor to the World Trade Center in New York, designed by Minoro Yamasaki and Antonio Brittiochi, and built in the early 1970’s. (In a case of strange coincidence, a retrospective of Mies van der Rohe’s architectural works finished its exhibition run at MOMA on the day the WTC twin towers were leveled by Al Qaeda.) The repeated pairs of buildings in Bunker Architektur bare an obvious likeness to the WTC. But twin towers were a common idea of architects following the International Style, and we have to recognize the date of the picture and admit that we are likely seeing ghosts. In 1977 the WTC towers were only a few years extant, but it is easy today to imagine Bandau’s corporate landscape, sinking into the shadows the way his watercolors do, as an exercise of reconstruction overkill. Bandau is best known in Europe for his sculptural work, though a demonstration of this is not in the Sweetow Gallery, which displays only three small wall sculptures. 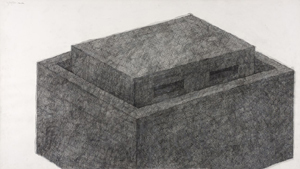 These sculptures, which look like abstract variations on German blockhouses, function in the context of the show purely as connective tissue between the drawings and the paintings. They are positioned as such, hung on the dividing wall between the other two groups of Bandau’s work. They appear to have been boiled down directly from the bunker drawings, and the watercolors appear to be further extensions of a distillation process that rededicates core spatial concepts within different physical and aesthetic parameters. 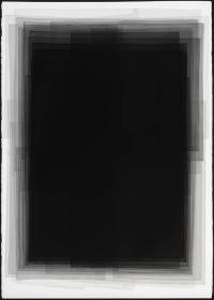 Unlike Gerhard Richter’s, Bandau’s abstracts reflect directly the religion of his representational pictures. Bandau has said that the watercolors had a discernible relationship to his sculptures only at first, but that this connection was severed within two to three weeks of working. All one needs to do is take a cursory walk through the exhibit to uncover the inaccuracy of this rejection. There is some serious inbreeding going on here, and more than a sniff of the intersection between architecture and painting that El Lissitzky had tried to achieve with his Prouns. It is a pleasure to look close and discover that the Black Watercolors are not flawless in their rectilinearity, but carry the bent corners and gently meandering waistlines of handmade shapes. This enunciates the concept of a man-made shelter, shelters (or bunkers) with walls that, upon close inspection, reveal the musculature of our own arms. On a purely technical level, the paintings of Kazimir Malevich, Josef Albers, and Dorothea Rockburne would be worth some comparison. A more valuable similarity of character could be found in the light and scrim installations of Robert Irwin, or the translucent sculptures of Christopher Wilmarth, both of whose works speak in terms of the vacantly beautiful spaces that Bandau relies on. Bandau’s gray panels, pasted over the ambient light of nothingness, have light penetrating through that is itself penetrated by the articles which reflect it. These watercolors are studies in invasion and seclusion. In a sense, these paintings are something like an illusionistic opposite to the formulaic tricks of Op Art painting. Where Op Art used mathematical recipes of line and color to tease the eye into perceiving deep and vibratory space, here Bandau does the reverse, baiting us to see sheer vacuums. This is odd for a sculptor. But perhaps it is not a completely sincere effort. Bandau has consistently depicted tight and hollow interiors, but had previously addressed his subject extrinsically, implying its dimensions through drawings or sculptures of the “shells” surrounding these spaces. The eye’s arousal dulls and withers with relative quickness to Op art paintings. With his watercolors, Bandau is confronting us from within defensive chambers, the weight and guts of which are only visible through prolonged study. In this way, the black centers are not compounds so much as they are carvings or reductions. This quality of absence is present in all of Bandau’s sculptures, drawings, and paintings, and can be described to contain a kind of aniconic aesthetic, perhaps obliquely like early aniconic Buddhist artwork in its reliance on anthropomorphic environments. Aniconic artwork employs a conceptual exclusion of literal personification, and is different than the fear-induced iconoclasm of 8th century Byzantium or 21st century Taliban bulldozing. In the first four hundred years of Buddhist artwork, the Buddha himself was never literally illustrated in pictures. His presence was always implied by representations of the places he had formerly occupied, or symbolized by the evidence thereof, such as his footprints. The purpose of this was to convey the distance to the lay world erected by enlightenment, and its elusiveness to pedestrian forms of detection. The structural relationship between this and Bandau’s art is the combination of portrayed vacancy with the indication of residence. What is essentially unoccupied space in Bandau’s artwork carries with it the resonance of something lived in, and a space spoken from. On a picky note, the exhibition’s title, A Painter Doesn’t Dare: A Dialogue Between Sculpture & Watercolor is disappointingly boring, because the question it arouses is particular to nothing, and because it seems to suggest that the work has something to do with the artist’s nerve. These works are not nervy. They are a witness protection program. Bandau quietly escapes our grasp into his velvet black sanitarium, memorializing the past with sobriety in an attempt to euthanize the events that defined it. The issues of opacity and transparency, of surface bunkers and underground bunkers, of symmetry and asymmetry, of absence and tenancy, are for Bandau, the semiotics of being swallowed, of moving from one space to another, and descending through a system under remote, mechanized control. — Jordan Essoe is a writer based in San Francisco.